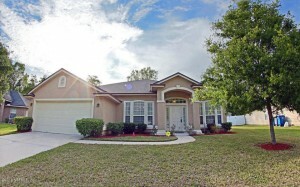 This weekend we have 1 open house showing saturday April 30th in North Jacksonville. Please come by and tour this beautiful home. There is a wonderful agent available to assist you and answer any questions you may have. Do you like being close to the action? Well look no further! This beautifully maintained SEDA built home is literally seconds away from Jacksonville’s River City Town Center (built in 2006 with over a 100 different merchants to chose from and a brand new state of the art hospital). You can enjoy shopping, fine dining, and entertainment while still in YOUR neighborhood. This home has it all. A large kitchen with 42 inch cabinets. A spacious living room, den, and laundry room. A separate dining area and breakfast bar. Huge master bedroom with dual closets for him/her. Very nice shower with separate tub. Dual vanities and mirrors throughout. Large backyard overlooking the lake. Two car garage and an alarm system. Bring your offers so we can bring you home! Contact Frederick Walker for more info!